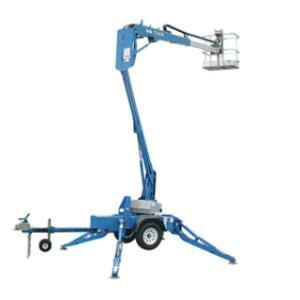 The Genie TZ 34/20 is a tow-behind boom lift that has a working height of 40' and a horizontal reach of 18' 4". It is ideal for painting houses, changing parking lot light fixtures, tree work, and hanging Christmas lights among other projects. The lift has a 440 lb lift capacity, hydraulic outriggers with an illuminated panel control box, and 359 degree non-continuous turntable rotation. The machine is 4' 9" wide stowed, the height is 6' 5", and the outrigger footprint measures 11' 10" wide by 10' 9" long.This lift needs to be towed behind your vehicle using a 2" ball mount, local delivery is available, rates vary by distance. Machine weighs 3, 200 lbs. Customer must take and use a safety harness and lanyard with this equipment. Additional deposit taken on harness. * Please call us for any questions on our lift articulated boom 34 foot rentals in Hillsdale and Ridgewood NJ.